The following is a condensed version of my full-length case study. 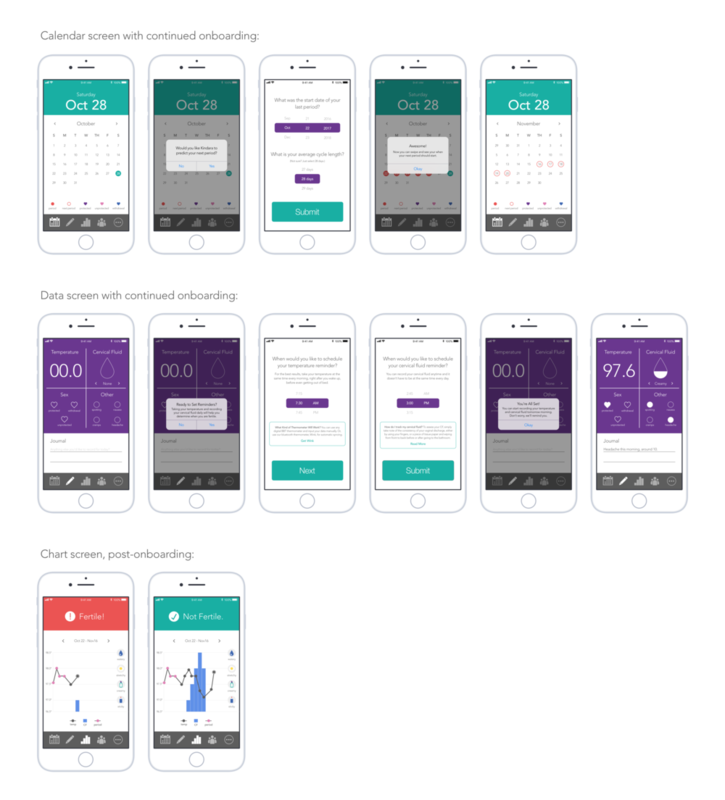 Kindara is a fertility tracking app that uses proven science to help you get pregnant faster, avoid pregnancy naturally or better understand your body. Women who are downloading Kindara for the first time are usually stressed because they are either having difficulty getting pregnant or wanting to avoid pregnancy naturally, without birth control. 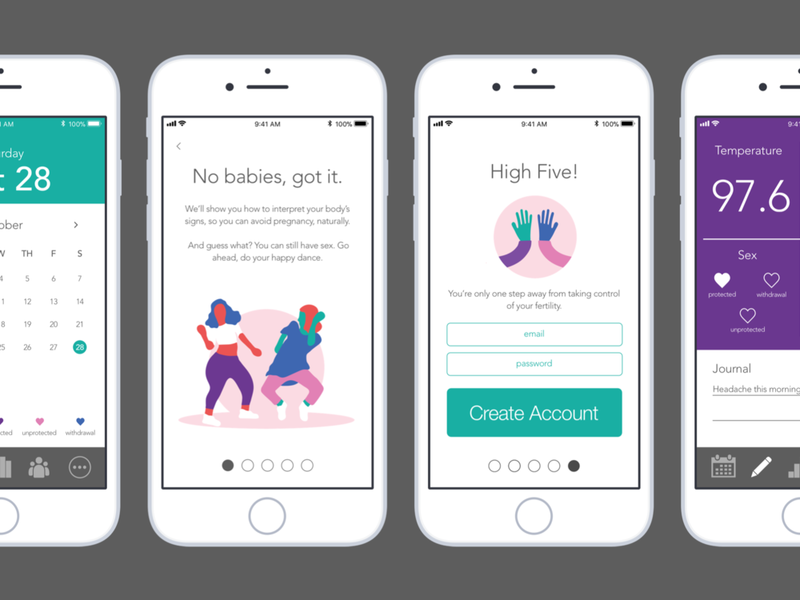 Kindara's onboarding process does not provide enough information about how to use the app, so new users are left feeling overwhelmed and in capable of understanding their fertility. 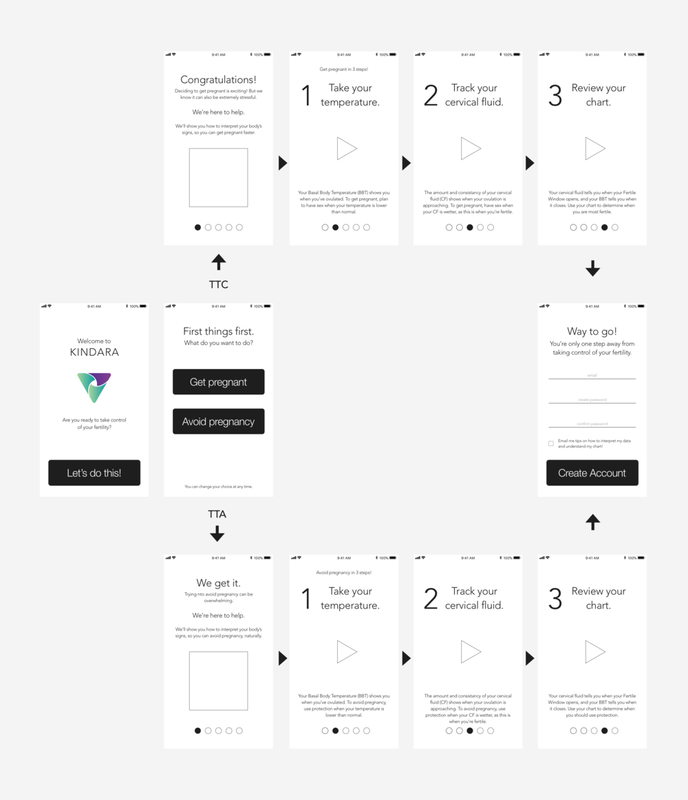 Once users complete onboarding, the app itself contains a wealth of information that, though important, can also be overwhelming for new users. I wanted to ensure my plans to enhance the experience for Kindara users also aligned with Kindara's business needs. I hypothesized that as users started to feel empowered about their fertility via the Kindara app, they would probably share their experience with other women, who might then download Kindara for themselves. Empowered users would probably also be more likely to upgrade to Kindara premium or purchase Kindara’s thermometer, Wink. My success in achieving this could easily be measured via Kindara turnover rates (which should decrease, if I’m successful) and by the number of new users downloading the app for the first time (which should increase, if I’m successful). I conducted some research to see if other users felt the same way I did. I sought out reviews of the Kindara app as well as their new fertility thermometer, Wink, on Amazon, Youtube, various blogs, and within the Kindara community. 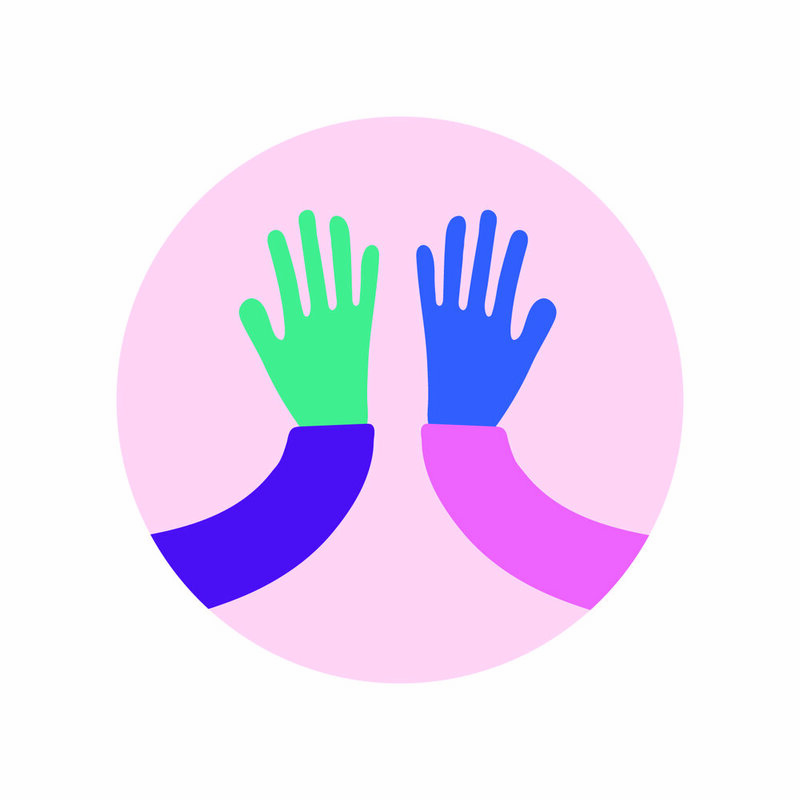 Next, I sought out four users of various ages and backgrounds to interview and conduct usability tests with. During the interviews, I took a lot of notes and recorded users as they downloaded and interacted with Kindara for the first time. Armed with an arsenal of insight, I set out to unpack everything I had learned from my users. I needed to get all the information out of my head and onto a wall. I wrote down everything that was either emotionally-charged or that seemed important on a post-it note and placed them around each user’s photo. The pink post-its represent general feelings about fertility and the blue post-its represent specific feedback about the Kindara app. 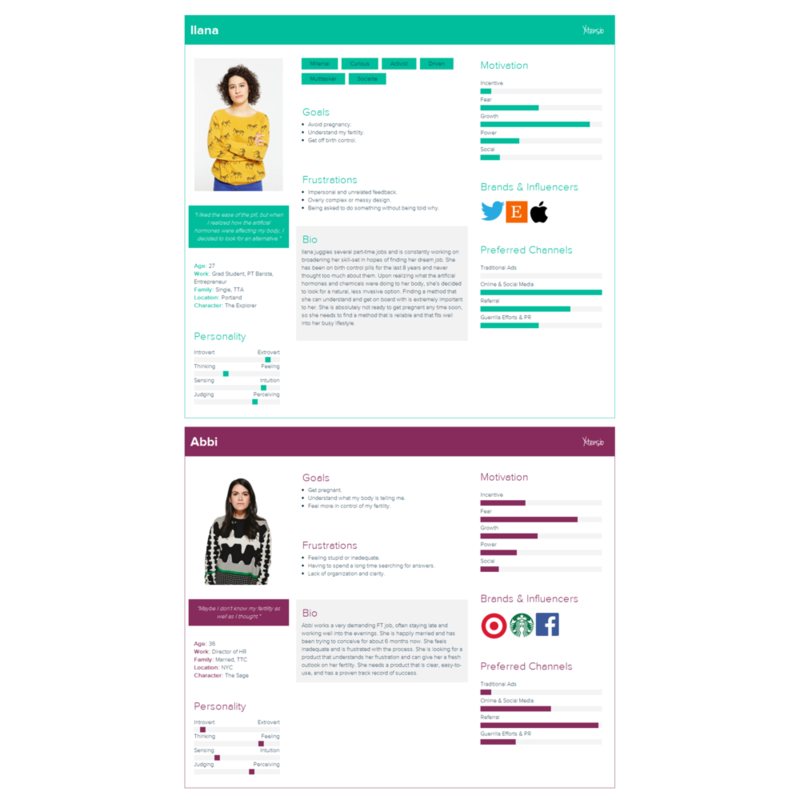 Using what I had learned about my users, I used Xtensio to create two personas: Ilana and Abbi. Ilana represents women who are trying to avoid pregnancy (TTA) and Abbi represents women who are trying to conceive (TTC). Though I probably could have created a few more personas, Ilana and Abbi were the types of users I wanted to focus on for this project. 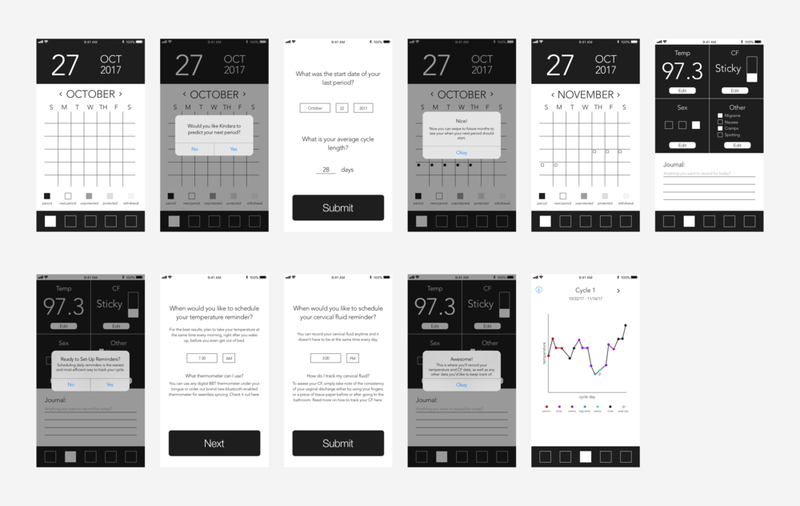 How might I improve the Kindara app to help empower new users to take control of their fertility? I took some colored pens and started marking up my user post-it wall. I used red to indicate problems with the app and purple to indicate emotional responses. I added yellow post-its with each emotionally-charged word expressed during my interviews, helping me keep user needs at the center of my design. Next, I moved the most compelling responses to the left of my wall so I could start to form a clearer understanding of the biggest issues. I analyzed this new group of responses and used an orange marker to circle any themes and patterns that emerged. Finally, I began to brainstorm solutions. I started adding new yellow post-its with as many solutions to my design problem as I could think of. After my wall was completely covered in post-it notes, I moved to my trusty moleskine to sketch out a rough draft of the IA for my intended onboarding process. After deciding on the basic flow of information, I went back and added notes on how I wanted users to feel at each interaction. I also created some quick sketches of what I envisioned for each of the touchpoints in my proposed solution. Having both my literal and emotional intentions set was really helpful when I moved to the prototyping stage. I started out with a paper prototype, complete with moving iPhone screen and pop-up inserts. This paper prototype was surprisingly enjoyable to create and play around with. It also made it much easier to transition into designing in Sketch. For my low-fidelity prototype, I used a very limited color palette, one typeface, and (almost) no design. Before moving on to my high-fidelity prototype, I referred back to my user needs yet again. I wanted to make sure I was advocating for them through my design. Since my UI was very minimal, I wanted to create some illustrations that would add a pop of color to my design. They add some playfulness and approachability to what was formerly a minimal, content-rich design. They visually reinforce the copy, strengthening the universality of the app. I started with the rich purple and turquoise colors from the Kindara logo and added a few others of my own. I made the conscious decision to stray away from “normal” skin tones for a more inclusive design experience. My intention for this part of the design was to explain how the app works and show the value that Kindara brings. I wanted new users to finish this onboarding flow feeling excited and confident in their ability to take ownership of their fertility. As you can see, women who are trying to get pregnant and women who are trying to avoid pregnancy are split up and follow similar, but different paths. By making this separation, I was able to cater the copy and images to each user, making them feel understood and valued. I didn’t want new users to feel abandoned once they created an account, so I designed some concepts for a post-onboarding experience as well. My intent for this part of the design was to reinforce the confidence instilled in the onboarding process via an approachable UI that allows users to effortlessly explore and learn the basics on their own, but also provides resources for those who want to take a deeper dive. Finally, I added some links, hotspots, and interactions to my design via the InVision Craft extension for Sketch. I kept the interactions fairly simple, opting for well-known design patterns to allow the content to shine. Click here to view the final prototype. If I had a second chance to redo this case study, I would spend more time talking to users and less time designing. Being my first experience with the UX process, I was eager to get to the solution and spend time perfecting every last detail of the design, in attempt to demonstrate a big improvement from the initial design. I should have put my paper prototype in front of users and used their feedback to inform my low-fi prototype and then done the same before creating my high-fi prototype. Creating a great user experience demands a consistent conversation with users, rather than just a lot of research up front. I would be interested to see how much my "final" design would change if I put it in front of users again.